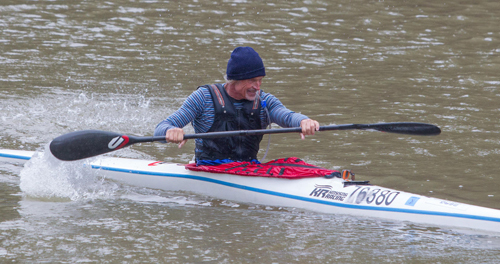 The 240km journey from Paarl to Velddrif is one not taken on by many however 65 year-old Lee McGregor plans on defying the odds once again in 2016 as he eyes out a potential top ten finish at the Berg River Canoe Marathon which takes place from 13-16 July. McGregor, father of ten-time Berg winner, Hank McGregor, surprised all when he finished eighth overall at the age of 62 in 2013 before repeating the remarkable feat again the following year and, worryingly for his opponents, the cult figure does not see himself slowing down as he heads into the 54th edition of the four day race in the Western Cape. While having taken on his training schedules with the mind-set that he needs to consistently be able to paddle as fast as the fastest paddler – a mantra that has brought him success in flat water marathon paddling – a comical McGregor is sceptical his technique will continue to bear fruit in the four day slog. “The Berg is a completely different race; it is completely unique in that you have to race consistently well for four days and I will have to work out what the pace on each day will be in order to determine what my optimum speed is. “In marathon paddling you can work out what the race speed is going to be beforehand however with the Berg you never know. “You can be sure that I am going to die every day of the race but like a true 1951 diesel engine, I will come back the next day and do it all again!” a determined McGregor commented. McGregor runs the MACSquad, a team of paddlers that train at Blue Lagoon in Durban, and he and his paddlers will be heading down to the Cape to trip the river a week before the race gets underway in Paarl. “There are eleven of us going down to check out the river, familiarise ourselves with it and work out the danger areas – something that is important with the tree blocks that can occur on the Berg River. “I always say that you need to train how you race and I don’t want to make the same mistake I did in 2014 where I got confused and got myself into some trouble on the river, so testing the river a week before the race will put us all in a stronger position,” he added. As a decorated Masters marathon paddler, the Berg River Canoe Marathon provides McGregor with the ideal base in his pursuit of another Masters World Cup title in Germany in September with him once again set to test himself against paddlers from around the world who are over a decade younger than him. “I have won eight Vets titles and will be back again this year to race in the 50-54 year old category. If I had a balaclava I would try and race the twenty-year-olds, but I wouldn’t get away with that!” he chuckled. “The excuse is that you are too old to compete but, in my view, if you have enough time to train, which people of my age do, then there is no excuse to not keep on competing. “I feel really privileged to still be strong and healthy and I feel like I am better and stronger than I ever have been, so I really don’t see why I should stop! “The guys in front of me at the Berg better not look back because I am going to be coming for them!” McGregor cautioned ominously.